Sun in Scorpio craves depth, while Moon in Libra needs to keep it nice. Their radically different approaches to relationships can make it challenging for this couple to stay together. But they both share the desire to be with someone. Sun in Scorpio can go for years (if necessary) without a partner. He craves intimacy, but it has to be with the right person. When he finds that person, Sun in Scorpio will reveal more about himself than most people want to know. And he’ll expect the same from his lover. He won’t be content with light anecdotes about the workday; this sign wants to feel what’s happening in the darkest corners of his partner’s soul. The uglier and more forbidden, the better. His lover must be willing to get naked (literally and metaphorically) on a regular basis, because he will never be satisfied with surface interactions. This sign represents the Shadow, and he’s comfortable there. 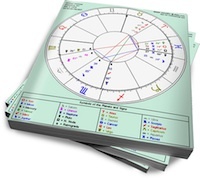 Moon in Libra needs to be in a relationship, but she’s more comfortable with the airbrushed version. She’s willing to do whatever it takes to keep her partner happy (often at the risk of her own needs), and conflict makes her very uncomfortable. In her heart, Moon in Libra is a romantic; the key to her happiness is tokens of appreciation (that her lover might think are just window dressing). But flowers and a card mean a lot to her. Moon in Libra will have her balance seriously challenged by Scorpio’s demands. He’ll push for something deeper, she’ll try to oblige, but will be profoundly uncomfortable with his relentless, confrontational style. Sun in Scorpio may get impatient with Libra’s discomfort, and decide that she doesn’t have what it takes to be his fearless soulmate. However, if he’s gotten far enough to want this much from Libra, it probably won’t be easy for him to let go. If he can back off a bit, and if Libra can accept that not everything is going to be pretty, they might be able to make it work. This could be an exercise for Moon in Libra to insist on her own needs (Scorpio respects those who stand up to him). Hi, does this only aply for male sun sign and female moon sign ? Or can I read this both ways ?